Aqua of Life Supports Free Meals for Elderly. When you purchase Aqua of Life mineral water, it's not just a bottle of water, it's 365 days of free meals for elderly residents. 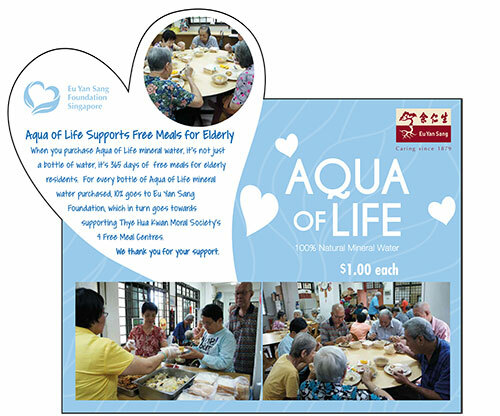 For every bottle of Aqua of Life mineral water purchased, 10% goes to Eu Yan Sang Foundation, which in turn goes towards supporting Thye Hua Kwan Moral Society's 4 Free Meals Centres. Average human drinks over 60,566 litres (16,000 gallons) of water in a lifetime.